diabetic roti recipes. diabetic paratha recipes. This section will surely come as a surprise to those who have always considered rotis to be boring and parathas to be too rich for diabetics. This exquisite range of rotis and parathas is extremely innovative. They are made using diabetic-friendly ingredients, which will help control blood sugar levels. We have a great collection of diabetic roti recipes. Bajra is rich in Magnesium which improves insulin response by lowering insulin resistance which is good for Diabetics. Try the basic bajra roti or stuffed bajra recipe with low fat paneer. Jowar is a complex carb and will be absorbed slowly in the blood stream and not cause a spike in insulin and rich in fibre being very diabetic friendly. We have the jowar roti recipe and mooli jowar roti for you to enjoy. Ragi benefits in diabetes. Ragi flour creates a much lower surge in sugar levels compared to wheat. So start with basic ragi roti recipe to stuffed ragi roti recipe with cauliflower, doodhi and fenugreek. Whole wheat flour is excellent for diabetics as they will not shoot up your blood sugar levels as they are a low GI food. So enjoy this whole wheat recipe made all over India. Whole wheat flour + fibre rich green peas make a healthy Green peas paratha recipe. Then low you add low fat paneer, green peas, coriander and mint leaves to make low fat paneer green peas paratha. The tasty and sumptuous recipes inside this section, such as Stuffed Parathas, plain parathas, toothsome rotis and theplas are also low in calories, which helps prevent other diabetes-related complications in the body. Enjoy these tasty bites to your heart's content! 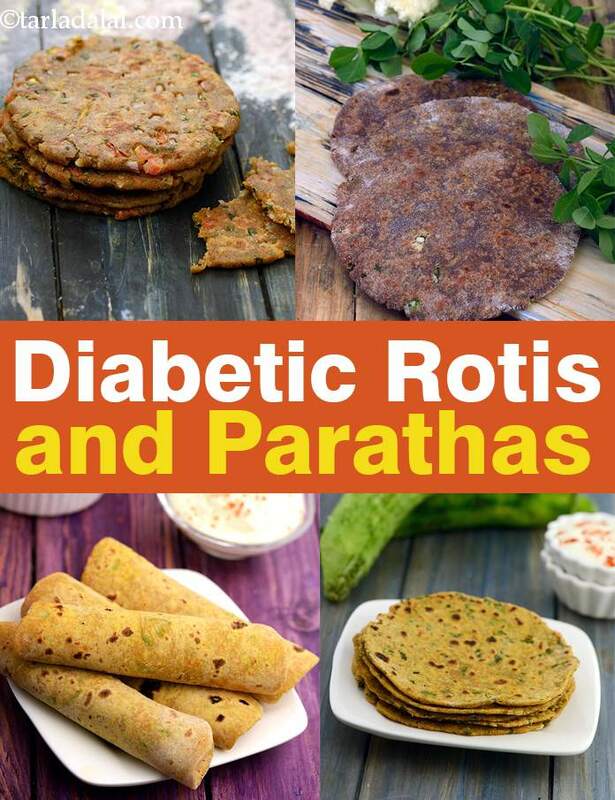 Enjoy our diabetic rotis and diabetic parathas and other diabetic articles below.